US, 2006, 104 minutes, Colour. Emma Roberts, Jo Jo, Sarah Paxton, Jake Mc Dorman, Arielle Kabbel, Claudia Karvan, Bruce Spence, Roy Billing, Julia Blake, Shaun Micallef. The press corps was remarkably self-controlled during the preview of Aquamarine, a film that was definitely not made for them. Perhaps they were thinking of their daughters (or granddaughters) and realising that this was the niche market. 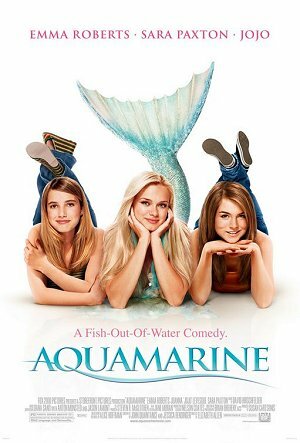 Aquamarine is a film for those younger girls who love Hilary Duff movies, some of the Lindsay Lohan movies and, definitely, those for whom The Princess Diaries movies were the best of the year. This is a giggly-squealy show. And Emma Roberts and Joanna (JoJo) Levesque (last seen as Robin Williams’ daughter in RV) as best friends 13 year-olds do more than their share of giggling and squealing. But they also get the chance to match-make for the life guard that they tend to swoon over. Since he is too old for them and since his girl-friend is what they describe on the beach as a ‘sand witch’, they are overjoyed when Aquamarine, a mermaid, turns up one morning after a tremendous storm in their swimming pool. She is a giggly Barbie type (Jessica Simpson was offered the role so that gives some idea, though Sarah Paxton has an enormous IQ edge over Jessica judging be her (limited) conversation). There are some minor crises because Aquamarine is keeping this all secret – she does have legs as well as a tail but her legs disappear when the sun sets so she has to get back to water in time, or else. And so on. Filmed in Australia’s Gold Coast standing in for Florida, the film has a number of serious locals like Julia Blake, Roy Billing, Bruce Spence, Shaun Micaleff and Claudia Karvan as JoJo’s? mother all doing a half-hearted best at American accents. This is the kind of film that our two heroines would love to take Aquamarine to see. 1.The niche audience for this film? Young girls? A male audience? Adult audience? 2.The Florida settings (filmed in Australia)? The beachfront, the ocean? Life in this Florida town? The youth? The musical score, songs? 3.The focus on Claire and Hailey? Their age? Friendship? Their always being together? Claire and her grief over her parents killed in an accident, her fear of going in the water? Hailey as the tomboy, the prospect of moving to Australia? The tense relationship with her mother? The mother deserted by her husband? The friendliness in the homes? The grandparents? Leonard and his working around the place? Marjorie? The setting for a film of giggles and squeals? Discovery of a mermaid? Matchmaking? 4.Emma and Claire, their characters, their time together, their confidences in each other? Their experience of the storm? Making a wish that Hailey did not have to go to Australia? The discovery of Aquamarine? 5.Popular stories about mermaids? The tradition? The tongue-in-cheek dialogue about mermaids and their reputation? Their qualities? Aquamarine and her being stranded, escaping from the fixed marriage, from her father, wanting to prove that love exists? Her travel, her coming on land, having legs? Having to go into water by sunset? Her friendship with Claire and Hailey? The t-shirt, her look? Their pushing her towards Raymond? Their own attitude towards Raymond, the other girls, Cecilia? Raymond as the lifeguard? 6.Aquamarine and her personality? Able to speak languages, travelling around the world? Fashion and the shopping? The meeting with Raymond, the attraction? On the pedal boat? Her having to run away? Claire and Hailey hiding her in the tank? Her going to the dance – her disappointment, thinking that Raymond did not love her? Her finally going, the dancing, her having to escape to the water tank again? 7.Raymond, the lifeguard, attractive to the girls, Claire and Hailey? Cecilia and her friends? The jokes with Grandpa and Grandma? His attraction towards Aquamarine, discussions, on the pedal boat? Cecilia and her machinations? His going to the dance? 8.Cecilia, her friends, catty, presumptuous? Her watching Aquamarine, discovering her in the tank, her friends not believing her? Going to her father, the TV – and her being exposed? 9.Hailey and Claire, their falling out, telling the truth to each other? Their concern about Aquamarine, the irony of Leonard reading the books about mermaids and rescuing her? Her going with Raymond on the pier, Cecilia pushing her over, the truth? Claire going into the water to rescue her? Hailey in the water? 10.The happy ending, Raymond and Aquamarine and the farewell? Claire and Hailey and their friendship despite going separate ways? Leonard with Marjorie? The happy ending for all concerned?